We welcome you to the last edition of your Business Essentials in 2018. 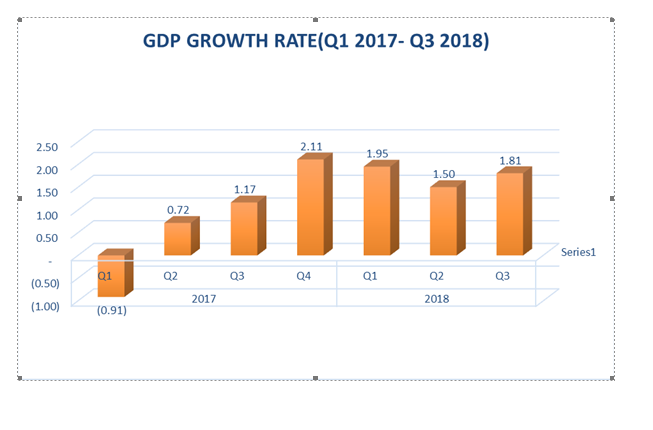 The recently released data by the National Bureau of Statistics (NBS) on the Nigerian economy’s growth in the third quarter of 2018 threw up interesting variables which we critically analysed. 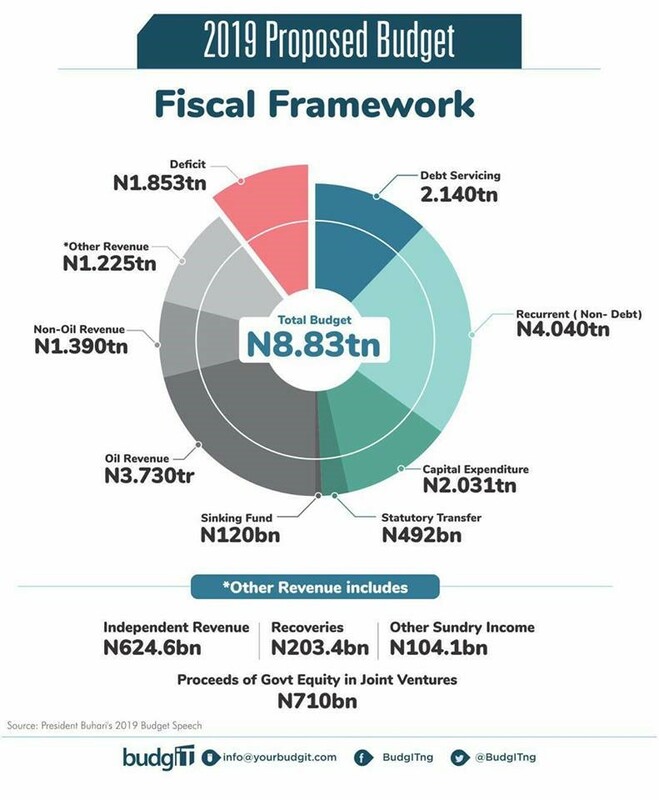 We also reviewed the 2019 Federal Budget proposal of N8.83 trillion recently presented to the National Assembly by President Muhammadu Buhari. 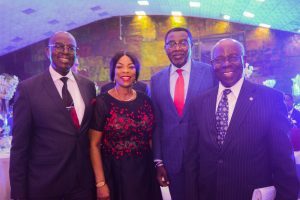 These and pictorials of the Send-forth ceremony of our outgoing Director-General, Mr. Olusegun Oshinowo, held on Thursday, 13th December, 2018 at NECA House alongside our regular Law Report Review and upcoming Learning & Development programmes were not left out. We wish you all a merry Christmas and prosperous New Year. Macro-Economic Overview: Nigeria’s Economic Recovery on Track, but Sectoral Growth Pattern Raises Concern. MACRO-ECONOMIC OVERVIEW: CENTRAL BANK MONTHLY BUSINESS SURVEY REPORT, NATIONAL BUREAU OF STATISTICS (NBS) 3RD QUARTER REVIEW (GDP & LABOUR MARKET ANALYSIS), 2019 BUDGET PROPOSAL AND MACRO-ECONOMIC INDICATORS. The macroeconomic indicators expressed optimistic in November, 2018 compared with October, 2018 according to the Business Outlook Survey (BES) released by Central Bank of Nigeria (CBN). In the report, the respondents’ overall confidence (CI) on the macro economy (25.9 index points) was more optimistic when compared to October, 2018(23.2 index points). The businesses’ outlook for December, 2018 also showed greater confidence on the macro economy at 65.6 index points. 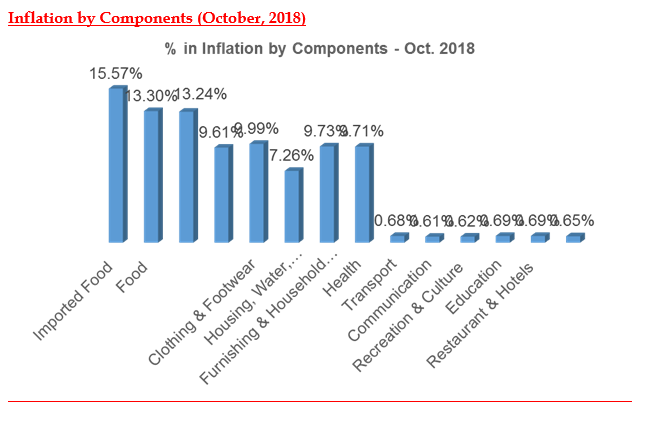 According to the report, the positive outlook of business in November 2018 was driven by the opinion of the following service sectors: services (14.9points), industrial (7.8points) and constructions (0.5 points) sectors. The drivers of the optimism for next month were services (37.0 points), industrial (19.2 points) wholesale/retail trade (6.6points) and construction (2.8points). However, the surveyed firms identified insufficient power supply (64.7 points), high interest rate (57.9 points), unfavorable economic climate (55.1 points), financial problems (51.2points), unclear economic laws (51.0 points), unfavorable political climate (48.6 points), access to credit (41.3 points) and insufficient demand (41.2 points) as the major factors constraining business activity in November. 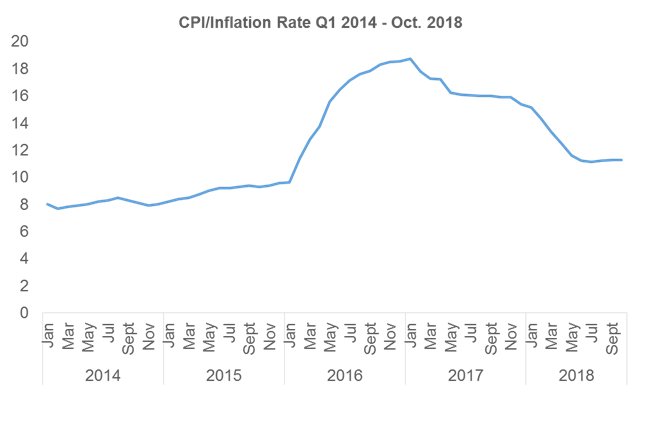 In terms of inflation rate, respondent firms expect inflation rate to rise in December, with confidence indices of 3.4 points. Similarly, respondents firms expect borrowing rates to rise in December as the confidence indices stood at 2.2 points. In the quarter under review, aggregate GDP stood at N33,368,049.14 million in nominal terms. This performance is higher when compared to Q3, 2017 which recorded a GDP aggregate of N29,377,674.03 million thus, presenting a positive year on year nominal growth rate of 13.58%. This growth rate is higher relative to growth recorded in the third quarter of 2017 by 2.88% points and higher than the preceding quarter by 0.01% points with growth rates of 10.70% and 13.57% respectively. Growth in the non-oil sector was driven in the review quarter mainly by Information and Communication; other drivers were Agriculture, Manufacturing, Trade, Transportation and Storage and Professional, Scientific and Technical Services. 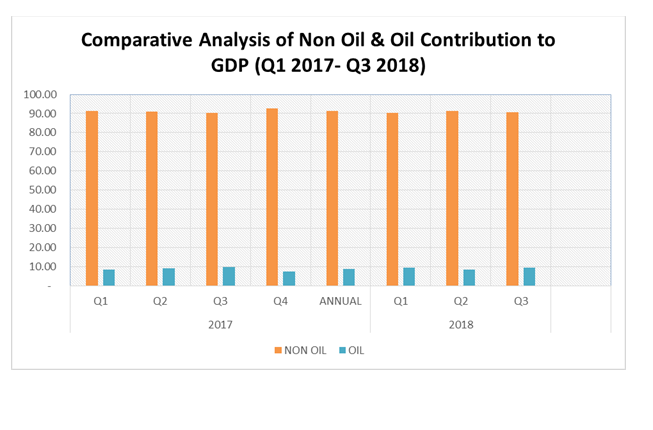 The non-oil sector contributed 90.62 percent of the growth in the quarter under review, with the oil sector contributing the remaining 9.38%. The third quarter of 2018 recorded an average daily oil production of 1.94million barrels per day (mbpd), lower than the daily average production of 2.02mbpd recorded in the same quarter of 2017 by -0.08mbpd but higher than that of the second quarter of 2018 production volume of 1.84mbpd by 0.10mbpd. The agricultural sector in the third quarter of 2018 grew by 1.91% (year-on-year) in real terms, a decrease by –1.16% points from the corresponding period of 2017, and an increase of 0.72% points from the preceding quarter. 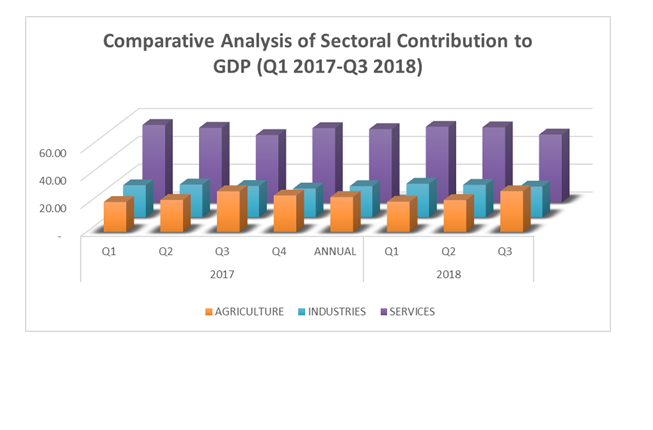 In the third quarter, the sector contributed 29.25% to overall GDP in real terms, higher than the contribution in the third quarter of 2017 and higher than the second quarter of 2018 which stood at 29.22% and 22.86% respectively. Real GDP growth in the manufacturing sector in the current quarter of 2018 was 1.92% (year on year), higher than the same quarter of 2017 and higher than the preceding quarter by 4.78% points and 1.24% points respectively. Growth rate of the sector, on a quarter-on-quarter basis, stands at 3.86%. Real contribution to GDP in 2018 third quarter is 8.84%. Government’s effort to diversify the economy from the non-oil sector could be one of the major reasons for an increase in Q3, 2018 GDP rate. However, the figure was below the Economic Recovery Growth Plan (ERGP) which the Government had projected the growth rate of GDP by an average of 4.6% during the plan and 7% by 2020. There is a need for Government to leverage on the non-oil sector and private sector to grow the economy and also implement the capital component of the 2018 budget. The high inflation rate, unstable power supply, appalling infrastructure are still major impediments for growth and developments. SUMMARY OF THE NBS LABOUR FORCE STATISTICS, Q3 2018 REPORT. 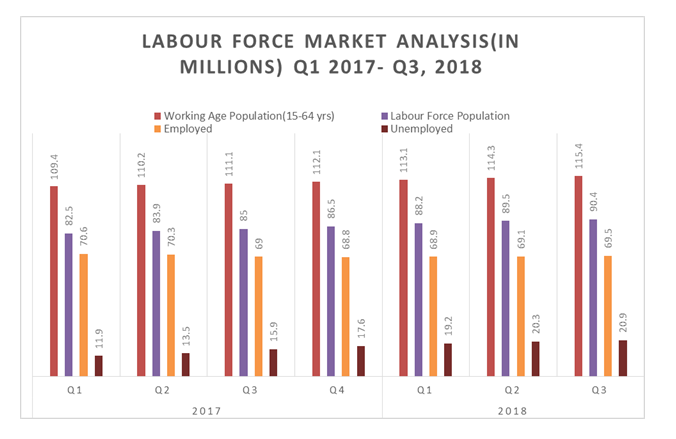 NBS released the figure for labour force statistics of Nigeria on Wednesday, December 19, 2018. 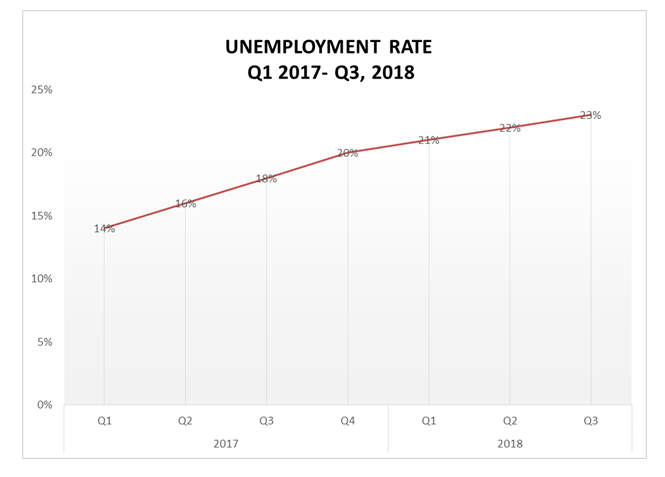 The figures showed that unemployment rate rose to 23.1 percent at the end of Q3 2018, up from 18.8 percent in the corresponding quarter in 2017. The unemployment figure rose to 20.9 million at the end of the period from 16 million in the corresponding quarter a year earlier. Active or working age population (15 – 64 years of age) increased from 111.1 million in Q3, 2017 to 115.5million in Q3, 2018. The number of persons in the labour force (i.e. people who are able and willing to work increased from 75.94 million in Q3 2015 to 80.66 million in Q3 2016 to 85.1 million in Q3,2017 to 90.5million in Q3, 2018. The total number of people in employment (i.e with jobs) increased from 68.4 million in Q3 2015, to 68.72 million in Q3 2016, to 69.09 million in Q3 2017 and 69.54 million in Q3 2018. President Buhari further explained that the 2019 Budget Proposal “is intended to further place the economy on the path of inclusive, diversified and sustainable growth in order to continue to lift significant numbers of our citizens out of poverty. The President also averred that the underlying drivers of the 2019 revenue projections have been adjusted to reflect current realities. On the expenditure side, allocations to Ministries, Departments and Agencies of Government were guided by the 3 objectives of the Economic Recovery and Growth Plan (ERGP), which are, (i) Restoring and Sustaining Growth; (ii) Investing in our People and (iii) Building a Globally Competitive Economy. The Minister of Budget & National Planning, Senator Udoma Udo Udoma also reiterated government desire to continue to create conducive environment for private sector to increase their investment and contribute significantly to job creation and economic growth at the public presentation of 2019 budget proposal. advise on ways of funding an increase in the minimum wage and the attendant wage adjustments, without having to resort to additional borrowings. implement these consequential adjustments in such a manner as to minimize their inflationary impact. The recommendation of the committee will be captured in the Finance Bill to be presented to the National Assembly together with the Minimum Wage Bill. OPEC is reportedly planning to release a table detailing voluntary supply cut quotas among its members and allies as it steps up its efforts to put a halt to one of the biggest oil price falls in years. The decision will take 1.2 million barrels per day off the market for the first six months of 2019. The surge of U.S. oil production, which has increased by 2.5 million bpd since early 2016 to 11.7 million bpd, has given OPEC and other oil pumpers more pressure in global market competition. The 15-member OPEC cartel has agreed to reduce its output by 800,000 bpd, while Russia and the allied producers will contribute a 400,000 bpd reduction. The meeting between OPEC and non-OPEC members comes at a time when the oil market is near the bottom of its worst price plunge since the 2008 financial crisis. Oil prices have crashed around 30 percent over the last two months, ratcheting up the pressure on budgets in oil-exporting countries. The resolution by the Organisation of Petroleum Exporting Countries (OPEC) to cut 800,000 barrels, or 2.5 per cent of members daily output, will see Nigeria’s daily oil production drop by a minimum of 43,775 barrels, effective January 2019 and the drop is expected to remain in place for an initial six months period until June 2019. 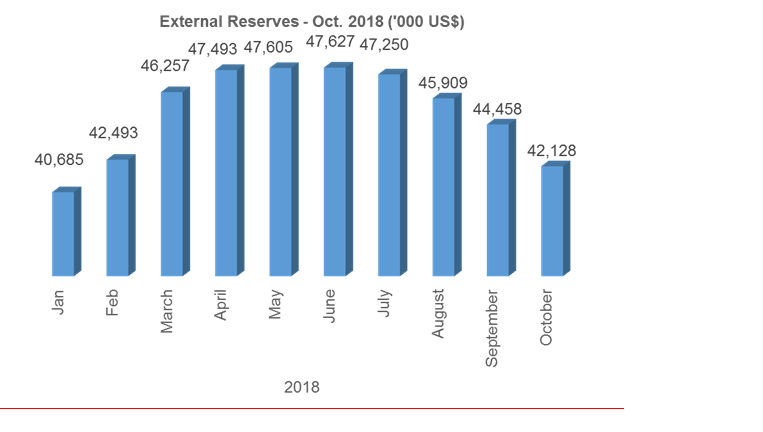 In September, OPEC’s secretariat secondary sources put Nigeria’s daily production capacity at about 1.768 million barrels, before dropping by about 17,000 barrels to 1.751 million barrels in October. But, direct communication sources, according to the group’s monthly report, gave the figure as 1.634 million barrels in September, up by about 138,000 barrels to about 1.772 million barrels in October. Based on its resolution, which said OPEC’s latest output cut by 2.5 per cent would be based on October production levels, Nigeria’s production is expected to drop by a minimum of 43,775 barrels to about 1.71 million barrels per day, effective January 2019. Other OPEC members will be expected to cut their production volumes as follows: Algeria with October production level at about 1.07 mbpd (26,750 barrels); Angola, 1.457mbpd (36.43 barrels); Congo, 324,000bpd (8,100 barrels), Ecuador, 525,000 (13,125 barrels); Equatorial Guinea, 131,000 bpd (3,275 barrels); Gabon 186,000 bpd (4,650 barrels) and Iran, 3.296 mbpd (82,400 barrels). Iraq, which produced 4.653 mbpd in October will cut about 116,325 barrels; Kuwait 2,764mbpd (69,100 barrels); Libya, 1.114 mbpd (27,850 barrels); Saudi Arabia 10.642mbpd (266,050 barrels); United Arab Emirate 3.160 mbpd (81,750 barrels) and Venezuela 1.171 mbpd (29,275 barrels). Although Nigeria remains oil production sensitive relative to price, an oil price below the MTEF oil benchmark of $60pb will distort the fundamental pillars of the budget plan. In addition, a possible cut by OPEC in Nigeria’s oil quota could deal a significant blow to Nigeria’s fiscal consolidation efforts and this will force the government to revise its spending, possibly pulling the economy into a technical recession. 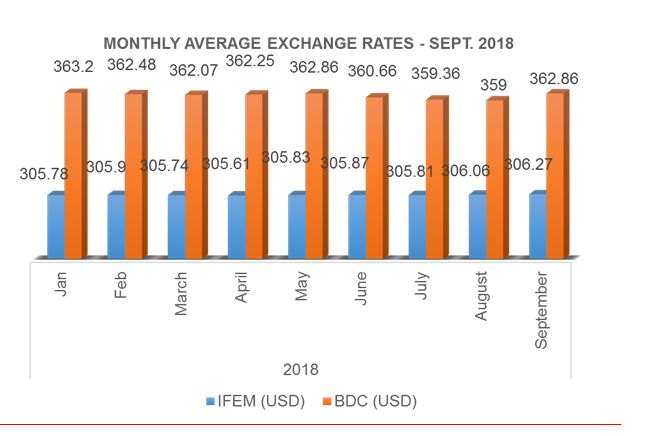 This will also weigh on key indicators such as the economic growth forecast of 3.01% in 2019, external reserves will move south of $40bn and exchange rate will depreciate by at least 5.4% to N380/$. This is also expected to widen Nigeria’s budget deficit, exerting more pressure on Nigeria’s current debt profile and debt servicing obligations. One of the objectives of the Federal Government of Nigeria is to improve the ease of doing business for investors through its various policies, programs, committees and interventions. However, some of the subsisting policies and laws of the Federal Government appear inhibitive when critically evaluated in the light of current realities. Undoubtedly, the provisions of Section 33 of the Companies Income Tax Act (CITA) on the requirement for minimum tax is one of the controversial tax provisions that require some critical analysis and consideration for potential review. It appears that the proposed amendment to the CITA in the National Tax Policy may have contemplated some of the concerns raised in this article because it intends to remove net assets as a basis for computing minimum tax, and amend the applicable rate and amount of turnover in arriving at minimum tax payable. 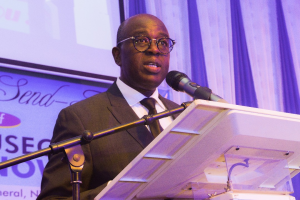 However, it is necessary to examine the merits of the proposed changes in the wake of the need to increase government’s revenue through taxes vis-à-vis the continued relevance of the minimum tax provision to some critical sectors of the economy. In this article, we have reviewed the provisions of Section 33 of the CITA referenced above, in the light of current demands of businesses, and suggested recommendations for making it fit-for-purpose. Section 33 (1) of the CITA provides that – “Notwithstanding any other provisions in this Act where in any year of assessment the ascertainment of total assessable profits from all sources of a company results in a loss, or where a company’s ascertained total profits results in no tax payable or tax payable which is less than the minimum tax, there shall be levied and paid by the company the minimum tax as prescribed by subsection (2) of this section”. 25% of turnover of the company for the year. The exceptions to the above provision are where the company is in its first four calendar years of operation, or is engaged in agricultural trade or business, or if the company has at least 25% imported equity capital. The minimum tax provision is one of the anti-avoidance strategy that applies to companies during years in which they do not declare taxable profits or where the tax payable is less than the minimum tax. Thus, the intention is to ensure that companies always pay tax, given the possibility of some companies arranging their affairs in a manner that puts them in a position where they have less tax to pay. From a government revenue generation perspective, the collection of minimum tax provides guaranteed income from a fair number of operating corporate entities to which minimum tax applies, such that there is never a situation where the government will not be able to earn tax revenue from corporate entities (with the exception of exempt companies). The basis for computing minimum tax as stipulated by the CITA is such that the highest of the values derived from the specified percentage of the parameters listed in the introduction above is selected and added to a proportion of a company’s revenue in excess of N500,000. The import of this specified model is that companies affected by the minimum tax provision may be required to pay tax on their paid-up capital or net assets. It should be noted that the computation of minimum tax on net assets may be less impactful to the extent that a company’s net asset position would be reduced by the value of losses made in any particular year. However, liability to minimum tax becomes unreasonably burdensome where a company reportedly makes huge turnover in a given year but ends up in a disadvantaged profit or loss position. This could lead to a situation where the company has no tax to pay or the tax computed is lower than minimum tax owing to its huge cost profile or inherent sector-related profitability constraints. The imposition of minimum tax on companies on this situation has the potential of increasing the risk of huge cash flow issues as well as potential corporate failure especially during economic downturns. Given that the same assets form the basis of computing capital allowance in any given year, it appears counterproductive to expect companies to pay minimum tax, which will be computed as a proportion of net assets. This can discourage companies from investing in assets, as a higher asset base may result in higher minimum tax payable. In addition, computing minimum tax on the paid-up capital of companies only implies that the capital with which a company should drive organic growth either during the early years of a business or during a downturn is depleted through government’s collection via minimum tax. Consider Company A, registered to engage in the sale of refined petroleum products in the downstream sector of the oil and gas industry. Company A has been in existence for over four years. However, it has been involved in building tank farms to enable it store petroleum products, prior to commencement of the business it was registered to do. Given the time it took the company to complete the construction of the tank farms, and the cost incurred, its net asset base increased year-on-year until completion of the construction. The implication of this was that Company A was exposed to minimum tax whilst constructing the tank farm, albeit having not made any sale petroleum products. The situation described above represents the current state of many companies who are more or less struggling to make profits due to operational constraints, macroeconomic challenges and general economic downturn. It thus becomes harmful to the growth plan of such companies on the one hand, and counterproductive for the government that seeks to expand the economic base to continue to impose minimum tax on distressed companies. For instance, distribution companies in the power sector are currently exposed to minimum tax because the value of the assets taken over during the privatization process was significant. Although these companies generated huge revenues, they have consistently reported financial losses due to myriads of operational challenges affecting the power sectors, such as collection losses, non-cost reflective tariffs, electricity theft etc. However, they are still required to comply with the minimum tax provision of the CITA, due to their huge net assets and revenues. Notwithstanding the fact that the declaration of profits is subject to the manner in which a company’s financial statement is prepared, there is a general assumption that companies’ financial reports reflect the true and fair state of affairs when audited by qualified statutory auditors. Thus, there should be a high level of reliance on companies’ audited accounts except an extraordinary investigation is conducted to establish an incidence of fraud. Nevertheless, we are aware that some companies’ loss positions could sometimes be due to the development of creative means of avoiding tax or poor management of the company. Under these circumstances, a properly handled tax audit or investigation is sufficient to enable the government to generate the taxes due to it. Tanzania The system is also less punitive as companies are only liable to minimum tax where they declare tax losses for three (3) consecutive years. United States of America The Alternative Minimum Tax (AMT) was repealed effective 2 January 2018. Argentina A minimum tax of 1% of the addition of current and non-current assets is applicable. From a review of the practice in the above listed jurisdictions, it is obvious that the imposition of minimum tax is a common anti-avoidance measure. However, there is need to domesticate every policy of the government in a manner that would reflect the specific realities of the economic circumstances of the Country. Section 23(2)(b) of the CITA stipulates that “the President may exempt by order from tax all or any profits of any company or class of companies from any source, on any ground which appears to it sufficient”. Consequently, the fact that many of the companies that are currently liable to minimum tax are comatose and may not survive, implies that the government should consider granting exemptions to certain companies. Thus, similar to the grant of tax holidays to certain categories of companies, the Government should consider evaluating the financial situation of certain sectors that are considered critical to the overall growth of the Nigerian economy, and exempt companies operating therein from paying minimum tax. If minimum tax must be paid, the model for computing it needs to reflect the true state of affairs of affected companies. Although this may be demanding on regulators, it is a necessary step in growing the various sectors of the economy. In addition, it is important to expedite the amendment of the relevant sections of the tax provisions where changes are necessary for development, to ensure that investors are not dis-incentivised through outdated, but subsisting regulations and policies of the government. 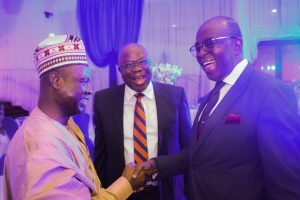 PICTORIAL: THE SEND-FORTH PROGRAMME FOR MR. OLUSEGUN OSHINOWO, OUTGOING DIRECTOR-GENERAL OF NECA. 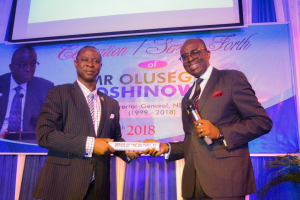 Mr. Olusegun Oshinowo passes on the baton of office of the Director-General to the Director-General Designate, Mr. Timothy Olawale. 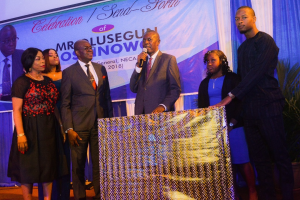 President of NECA, Dr. Mohammed Yinusa presents a gift to Mr. Olusegun Oshinowo on behalf of the Association. a)A declaration that the deduction of the sum of N2,400,000.00 (Two Million, Four Hundred Thousand Naira only) by the defendant from the claimant’s remuneration package for a period of four (4) years is illegal and unlawful. b)A declaration that failure of the defendant to make a mandatory contribution to the claimant’s Pension Manager from 2009 to 2013 is a violation of the provisions of the Pension Reform Act. c)The sum of N2,400,000.00 (Two Million, Four Hundred Thousand Naira only) against the defendant being the claimant’s transport allowance illegally deducted by the defendant from the claimant’s remuneration package from the year 2009 to 2013.
d)An order directing the defendant to remit all the outstanding mandatory contribution belonging to the claimant to claimant’s Pension Manager. e)The sum of N1,000,000.0 (One Million Naira only) against the defendant being the cost of legal services incurred by the claimant in litigating this suit. The Defendant did not enter any appearance in the matter. Whether failure of the defendant to file a defence, having been given ample opportunity does not amount to admission. The argument of the claimant here is that since the defendant did not enter any defence, her evidence is unchallenged, which should accordingly be accepted by the Court and used as such. See: Mani vs. Shannon  4 NWLR (pt. 969) p.132 at 1567, Consolidated Reg. Ltd vs. Abofar Ven. Ltd  6 NWLR (pt. 1031) p.221 at 231. Whether the claimant has discharged the onus placed on her having regard to the totality of her pleading and given her oral and documentary evidence, which were not challenged. See: Ajidahun vs. Ajidahun  4 NWLR (pt. 654) p.605, NIPOST vs. Irbok (Nig.) Ltd  8 NWLR 1 (pt. 982) p.232. A)That the failure of the defendant to remit the mandatory contribution to the claimant’s Pension Manager from 2009 to 2013 was a violation of the provisions of the Pension Reform Act. B)The defendant is to pay to the claimant the sum of N2, 400,000.00 (Two Million, Four Hundred Thousand Naira only) being the claimant’s transport allowance illegally deducted by the defendant from the claimant’s remuneration package from 2009 to 2013. C)The defendant shall remit all the outstanding mandatory contributions belonging to the claimant to claimant’s Pension Manager. There was no order to cost; however, the orders are to be compiled with within 30 days of the judgment. It is imperative for employers to always fulfil their obligations under the contract of employment between them and their employees. One of which is to ensure compliance with the provisions of Social, Labour and Employment Laws, including the Pension Reforms Act. This would prevent unnecessary litigations and promote a harmonious working environment.